The progranulin gene (PGRN) encodes a pleiotropic molecule with anti-inflammatory actions and neuronal protective effects. Accordingly, PGRN-deficient mice have been demonstrated to develop enhanced inflammation and progressive neurodegeneration. Loss of function mutations of the PGRN gene have been also reported to cause frontotemporal lobar degeneration (FTLD), a neurodegenerative disease leading to dementia generally in the presenium. Since neurodegeneration might be negatively impacted by chronic inflammation, the possible influence of PGRN defects on inflammatory pathways appears to be of great relevance for the understanding of neurodegeneration pathogenic processes in those patients. However, no data about the inflammatory profile of PGRN-defective subjects have been so far provided. In this study, we analyzed serum levels of the pro-inflammatory mediators IL-6, TNF-α and IL-18 in FTLD patients with or without PGRN mutations, at both pre-symptomatic and symptomatic stages. We provide evidence that circulating IL-6 is increased in PGRN-mutated FTLD patients, as compared to both PGRN non-mutated FTLD patients and controls. In contrast, levels of IL-6 were not altered in asymptomatic subjects carrying the PGRN mutations. Finally, TNF-α and IL-18 serum levels did not differ among all groups of included subjects. We conclude that the profile of circulating pro-inflammatory cytokines is altered in PGRN-related symptomatic FTLD. Thus, our findings point to IL-6 as a possible specific mediator and a potential therapeutic target in this monogenic disease, suggesting that an enhanced inflammatory response might be indeed involved in its progression. Progranulin (PGRN), also known as granulin-epithelin precursor, is a pleiotropic molecule promoting survival, cell cycle progression, proliferation, and migration of several cell types, and is recognized as an important regulator of the wound-healing response [1, 2]. In the periphery, PGRN is involved in inflammation regulation and, as a whole molecule, it possesses anti-inflammatory effects [3, 4]. Within the brain, PGRN is up-regulated in neuroinflammatory conditions and its increased expression by microglia may be relevant in responses to brain injury, neuroinflammation and neurodegeneration [5, 6]. PGRN is encoded by a single gene on chromosome 17q21 and, interestingly, loss of-function mutations in the PGRN gene have been identified as a monogenic cause of frontotemporal lobar degeneration (FTLD) [7–9]. Up to now, almost 70 pathogenic PGRN mutations have been described, and all are expected to cause PGRN haploinsufficiency (Alzheimer Disease and Frontotemporal Dementia Database. http://www.molgen.ua.ac.be/FTDmutations/). Patients with PGRN mutations may present with initial disease symptoms typically in their 50s or 60s, with a wide spectrum of disease onset and clinical presentation . The heterogeneity of PGRN-related FTLD suggests that several other factors of both genetic and environmental nature, including inflammation, can influence disease expression. Indeed, similar to other neurodegenerative disorders, inflammatory mechanisms might participate in the pathophysiology of FTLD, since the disease is characterized by in vivo activation of microglia , and increased levels of intrathecal pro-inflammatory mediators [12, 13]. However, no data in FTLD patients establishing a link between PGRN mutations and inflammatory changes have been so far provided, and demonstration of an imbalance in inflammation pathways and establishment of the timing of inflammation abnormalities in PGRN-related disease might be of crucial help in identifying new therapeutic targets for this orphan disorder. In the present study, we evaluated FTLD patients with and without PGRN haploinsufficiency for circulating levels of cytokines with pro-inflammatory action that are likely relevant to neurodegeneration, epitomized by IL-6, TNF-α and IL-18. In particular, IL-6 and TNF-α, which are measurable in human serum, were chosen here as inflammatory markers because of their implication in the animal model of PGRN deficiency-mediated neurodegeneration . In addition, the cytokine IL-18 was also included in this study because of its pivotal role in neuroinflammation and its association with cognitive decline in demented patients with Alzheimer's disease . Finally, asymptomatic PGRN mutation carriers were evaluated to assess the inflammatory cytokine profile in pre-symptomatic disease stages. Patients were recruited who met clinical criteria for FTLD [16, 17]. All subjects underwent a somatic and neurological evaluation, routine laboratory tests, a brain structural imaging study, and blood sampling for genetic screening and serum PGRN dosage. The diagnostic assessment was accomplished by a review of full medical history, a semi-structured neurological examination, and a complete standardized neuropsychological status evaluation. Inclusion and exclusion criteria were applied as previously reported . A group of healthy controls (HC) were further included. They were neither related to one another nor to FTLD patients; in particular, we selected only subjects in the same patients' age range, with a MMSE score ≥26 and a formal neurological examination that excluded the presence of a dementing condition. Moreover, siblings belonging to families of FTLD patients bearing PGRN mutations were considered. Cognitive or behavioral deficits were excluded by a standardized neuropsychological assessment. These were subgrouped into asymptomatic subjects carrying PGRN mutation (ASYMP-PGRN+), to assess inflammatory profiles before PGRN-related FTLD onset, and those without PGRN mutations (ASYMP-PGRN-). A control group similar in age composition was recruited as well. The study was performed with the understanding and written consent of each subject, and was reviewed and approved by the local ethical committee. Venous blood samples were drawn from each patient for PGRN sequencing. Total genomic DNA was prepared from peripheral blood according to standard procedures, as previously published . All the 12 exons plus exon 0 of PGRN and at least 30 base pairs (bp) of their flanking introns were sequenced. Serum PGRN was assessed by enzyme-linked immunosorbent assay (ELISA) kit (AdipoGen Inc), according to the manufacturer's instructions. Similarly, IL-6 and TNF-α were measured using specific high-sensitivity ELISA kits (Quantikine HS, R&DSystems), while IL-18 was determined using antibodies (coating: clone 125-2H; detecting: clone 159-12B) and standards from MBL (Nagoya, Japan). The limit of detection for these assays was 0.16 pg/ml for IL-6; 0.5 pg/ml for TNF-α and 15 pg/ml for IL-18. Comparisons among the subject groups on continuous variables were performed using univariate analyses of variance. Correlations between cytokine serum levels and demographic or clinical characteristics were performed by using correlation analyses (Pearson's r) and Fisher's r to z transformation. The level of statistical significance was set at P < 0.05. Ninety-two FTLD patients, namely 78 without PGRN mutations (i.e. FTLD PGRN-) and 14 carrying PGRN mutations (FTLD PGRN+; g.1977_1980delCACT, n = 13 and g.2473C > T, n = 1) along with 59 healthy age-matched controls were included in the present study. The socio-demographic, clinical and biochemical data about the FTLD patients and the age-matched control subjects are summarized in Table 1. Cytokine levels were analyzed in serum of all subjects and expressed as mean pg/ml ± SEM. FTLD: frontotemporal lobar degeneration; PGRN-: no progranulin pathogenetic mutations; PGRN+: progranulin pathogenetic mutations. As reported in Figure 1, in FTLD PGRN+, serum IL-6 levels were significantly increased (4.95 ± 1.61) as compared to FTLD PGRN- (2.74 ± 0.31, P < 0.001) and HC (2.00 ± 0.20, P = 0.009). Serum IL-6 levels in FTLD patients and control subjects. IL-6 levels in FTLD patients carrying (FTLD PGRN+, black bar) and not carrying (FTLD PGRN-, grey bar) progranulin mutations and age-matched healthy controls (HC, open bar). Results are reported as histograms representing IL-6 pg/ml mean values with SEM error bars. 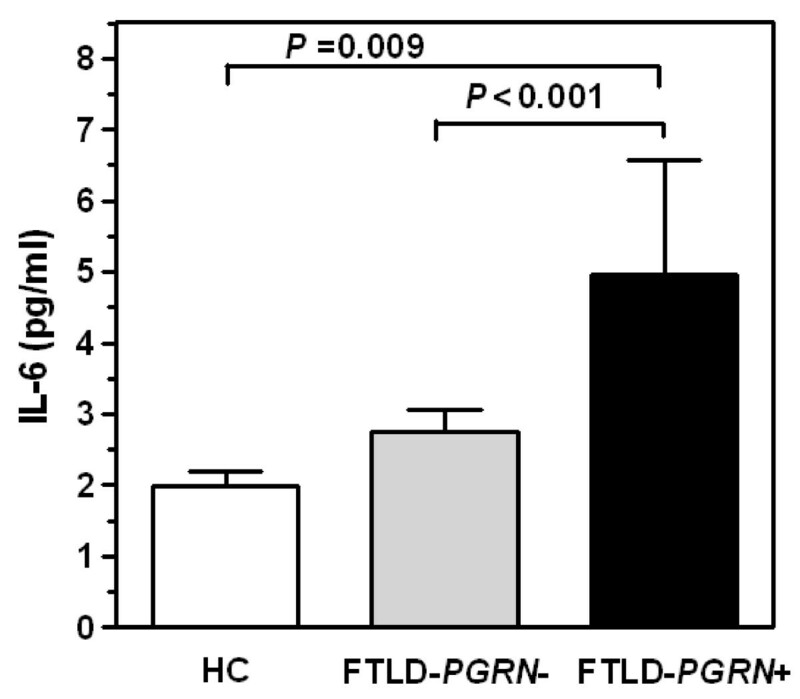 TNF-α did not significantly differ in FTLD PGRN+ (1.33 ± 0.79) as compared to FTLD PGRN- (3.17 ± 5.80, P = 0.656) and HC (2.14 ± 1.54, P = 0.201). Comparably, no differences in IL-18 levels were observed in FTLD PGRN+ (443.7 ± 168.6), than FTLD PGRN- (414.2 ± 139.1, P = 0.582) and HC (433.3 ± 178.9, P = 0.848). There were no significant correlations between levels of the three cytokines analyzed and cognitive impairment, as measured by Clinical Dementia Rating for Frontotemporal Dementia and Mini-Mental State Examination, in FTLD patients, regardless their PGRN mutation status (data not shown). In order to verify whether increased levels of IL-6 detected in FTLD with PGRN mutations were present before the development of the disease, we analyzed 11 ASYMP PGRN+ (g.1977_1980delCACT). At the time of recruitment, these subjects belonged to the second generation of nuclear families, in which the case indexes showed a mean disease onset at 63.3 ± 2.3 years. Based on these demographic data, we are allowed to consider that ASYMP PGRN+ subjects, with a mean age of 42.9 ± 4.6 years, were enrolled in a period of their life almost 20 years before the estimated onset of symptoms. Eighteen young healthy subject controls and 14 ASYMP PGRN- young asymptomatic controls with no pathogenic PGRN mutations were included in the study as well. Demographic characteristics of the 3 groups are shown in Table 2. ** P < 0.0001, significantly different from ASYMP-PGRN-. ASYMP-PGRN-: young asymptomatic subjects with no pathogenic progranulin mutations; ASYMP-PGRN+: young asymptomatic subjects with pathogenic progranulin mutations. Different from what was observed in patients with symptomatic FTLD carrying PGRN mutations, the levels of IL-6 in patients who had not yet developed the disease were not higher than those of age-matched controls. There were no significant differences between ASYMP PGRN+ (1.03 ± 0.73) and ASYMP PGRN- (1.53 ± 2.06, P = 0.465) or age-matched young controls (1.51 ± 1.88, P = 0.459). These data suggest that IL-6 systemic dysregulation in FTLD subjects with PGRN loss may be associated with disease development. Similar negative results were also obtained for the other two cytokines, i.e. TNF-α and IL-18. Recent studies on PGRN-deficient mice suggest that endogenous PGRN plays a central role in the regulation of inflammatory cytokine production. In particular, PGRN deficiency causes progressive neurodegeneration through enhanced microglia activation and chronic inflammation characterized by increased production of pro-inflammatory molecules, such as IL-6 and TNF-α [14, 19, 20]. Indeed, the pleiotropic pro-inflammatory cytokines IL-6 and TNF-α have been proposed to exert both protective and detrimental effects in CNS, but their neurotoxic capability might prevail in chronic conditions [21, 22]. In accord with animal data, the main results of our study indicate that the pro-inflammatory cytokine IL-6 is significantly elevated in FTLD PGRN+ patients, as a consequence of both the loss of functional PGRN and the development of dementia. In the same direction, a previous study has shown that polymorphisms in the IL-6 gene can modify cognitive and behavioral performances in FTLD patients , supporting the potential specific role of this cytokine in influencing symptom occurrence in FTLD. However, in our sample of PGRN-mutated and non-mutated FTLD subjects, there was no correlation between serum levels of IL-6 and MMSE scores, suggesting that the relationship between peripheral cytokine elevation and cognitive impairment might be more complex than the association of cytokine gene variants with the disease. Different from IL-6, in our study TNF-α tends, without reaching statistical significance, to be higher in FTLD patients without PGRN mutations, as compared to controls. Indeed, another study reported that in FTLD patients versus controls, cerebrospinal fluid levels of TNF-α were significantly increased, without statistically significant changes in circulating TNF-α . Thus, it cannot be excluded that TNF-α might play a role in FTLD, likely independent upon PGRN haploinsufficiency, but this needs to be further investigated. Finally, although emerging data suggest that another pro-inflammatory cytokine, namely IL-18, might be associated with dementia of Alzheimer's type , in this study we did not observe any differences in IL-18 serum concentration between FTLD subjects and controls, suggesting that dissimilar inflammatory mechanisms might be implicated in the two different types of dementia. Overall, these data show for the first time a direct link between an increase in systemic inflammation and PGRN deficiency in FTLD patients, implicating IL-6 as a specific player in this type of FTLD-related inflammatory dysregulation. More specifically, as serum IL-6 concentration has been demonstrated to be unchanged in asymptomatic, preclinical stages of the disease, we can argue that an enhanced IL-6-dependent inflammatory response is crucial for symptom development and progression. Thus, pharmacological inhibition of inflammation, obtained for instance by treating patients with either anti-inflammatory drugs or, ideally, with specific cytokine inhibitors as anti-IL-6 or anti-IL-6R antibody, should be explored as a valuable intervention to slow neurodegeneration in PGRN-defective FTLD patients. This work has some limitations that need to be taken into account for discussion purposes. First of all, the number of subjects, namely patients carrying PGRN mutations, is low and the results should be further replicated in larger samples. Moreover, it might be of interest to study an extended panel of cytokines, to study peripheral versus intrathecal cytokine modulation, and to study ex-vivo cellular production of inflammatory mediators and post-mortem analysis of brain tissue to elucidate in depth the inflammatory response pathway changes that underlay PGRN insufficiency. Finally, although IL-6 apparently exerts a predominantly detrimental action in chronic brain disorders , the molecular mechanisms determining IL-6 effects on FTLD neurodegenerative pathways remain to be investigated. Despite these limitations, this study demonstrates for the first time an increased inflammatory response in PGRN-defective humans, suggesting that inflammation might participate in leading to the onset of FTLD symptoms, and highlights possible new molecular targets for PGRN-related FTLD treatment. This study received financial support from Italian Ministry of Health, Grants RF07.96B, RF07.39.1 and RC09-11 (PB). PB and BB designed the study. AA, GB, ES, GS, CC, AP and BB selected patients and performed all clinical evaluations. FS performed cytokine experiments. SA and DG performed the genetic screening. PB, FS and BB analyzed the data. PB and BB wrote the initial draft. All authors made contributions in writing and in discussing the manuscript. All authors have read and approved its final version.